It's January 4th. You know what that means? We are back at it. The Holidays are over, back to work, back to school, well into winter and the long march to Spring. Sound bleak? Well, it doesn't have to. If you live in Canada, which I do, you have to learn to embrace Winter. Sure, you can maybe escape it for a week or two but in the end you still have to just go with it. I was never very good at that but I have to admit now that I have kids I am much better. They see so much fun and excitement in everything that it is hard not to be affected by their enthusiasm. So we get out and skate, toboggan and just keep going no matter what and I kind of think that is the way to approach life in general. The Holidays are fun but I don't like the thought that there is a big build up and lots of fun and family and good food and then nothing for months on end, so I resolve (boy I hate that concept) to continue to enjoy and not treat the rest of the season like a punishment. Anyway, I am not a big cleanse, get your life back on track, 30 days of carrot juice kind of gal. To me that is just adding insult to injury. So let's have a great January and February and lets try to make the little things fun and special and not save it all up for a couple of weeks in December. Let's start with lunch. If you are brown bagging it, then don't condemn yourself to an uninspired meal of carrot sticks and rice cakes. Let's spice it up a bit, add some zing. 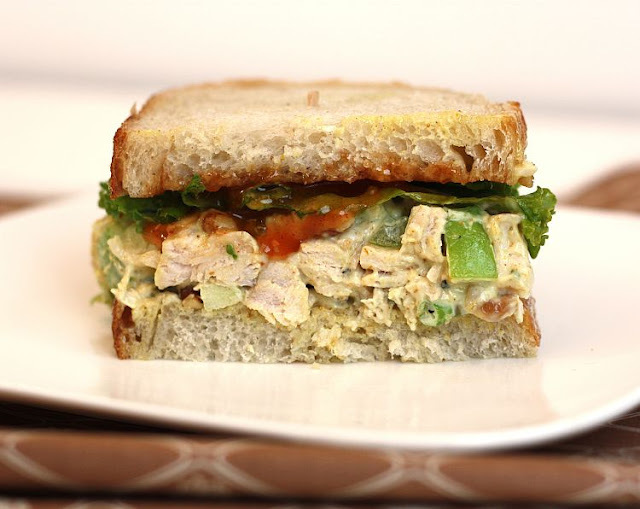 This little bit of chicken salad heaven is one of my favourite ways to use up leftover roast chicken. It is full of texture and taste. You can change up the ingredients to suit your palette but I love it with a mixture of green grapes, apples, celery, a bit of onion and some chopped walnuts. It is crunchy, sweet, spicy and cooling all at the same time. Serve it on its own or on some spring greens. I like it in a sandwich and I prefer a dense sourdough because I think it requires a bread that can stand up to all those ingredients. We have a great bakery here in Hamilton that uses local, organic ingredients called De La Terre. They also make a mean sourdough, so that was the perfect accompaniment. So delicious. Now we can start looking forward to January! In a small bowl, combine the diced chicken, vegetables, fruit and walnuts. Mix in the mayonnaise, curry powder, salt and pepper. Taste and adjust the seasoning to suit. You can either plate the salad with a bit of lettuce and add a dollop of Mango Chutney on the side or you can serve it on a sandwich. 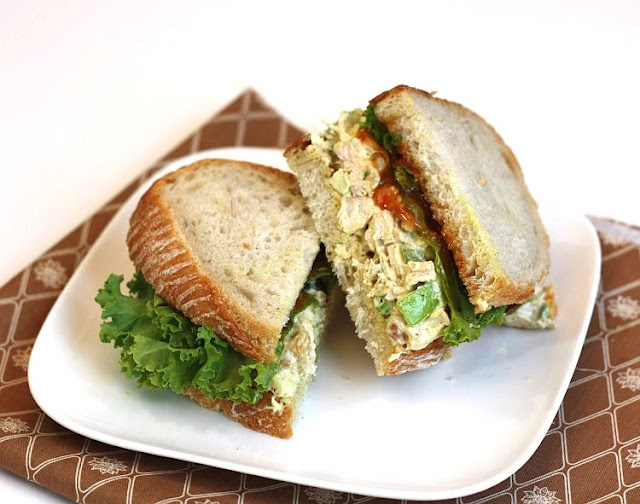 I spread about a teaspoon of Mango Chutney on both slices of bread (I like the Patak's Hot Mango Chutney but you can use any kind or leave it out all together) and then fill with the Curried Chicken Salad mix and a bit of lettuce. Enjoy! 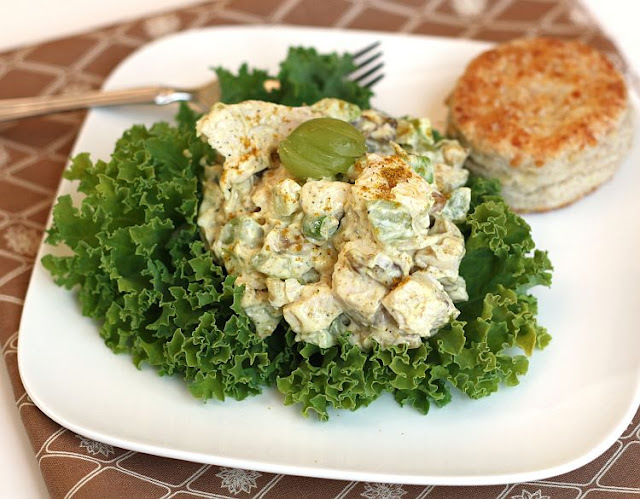 I am so obsessed with chicken salad but have NEVER tried to make my own before. I think after reading this (and drooling practically the entire time) I'm going to have to give it a try! Thanks for the comment, it is nice to meet someone else who thinks entirely too much about Chicken Salad (a little obsessed myself). Please feel free to leave a comment, I would love to hear from you. I'm Allison. I started Radishes and Rhubarb with the intention of sharing my passion for food, my favourite recipes and a few stories about the people and places that inspire me. I believe strongly in the importance of food; good food, fresh food, real food. This is where I find my inspiration. I hope you enjoy your visit and thanks for reading. For a background on why I chose the name Radishes and Rhubarb click on the image of my daughter's hand to read my first post. Radishes and Rhubarb Turns 2! I was asked to contribute to this beautiful new cookbook featuring recipes from foodbloggers around the world. Click on the picture to find out more. Text and Photography Copyright © Allison S. 2009-2011 unless otherwise stated. All rights reserved. Theme images by merrymoonmary. Powered by Blogger.